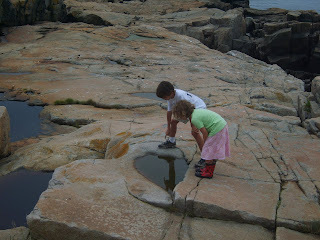 See August 12th post for an introduction to the Downeast Trip. We started driving Wednesday afternoon (August 6th). Our first stop was the new Penobscot Narrows Bridge (http://www.penobscotnarrowsbridge.com/). Rounding the curve on Route 1 with the first view of the new bridge took my breath away. I had the same feeling years ago driving through the Midwest and seeing the St. Louis Arch for the first time. In fact, just as the Arch is considered the “Gateway to the West”, it seems like this majestic bridge is a gateway of sorts to Downeast Maine. A few minutes after our first sighting, we found ourselves zooming up in the elevator to the bridge’s 42-story observatory. After the first few minutes of plastering myself to the inner wall, nervously watching the children run around by the windows, I managed to acclimate, and even climbed the final stairs to the glass room, soaring well over 400 feet above the river. What an architectural marvel with spectacular views of nearby Bucksport and the Penobscot River flowing into Penobscot Bay! After climbing around Fort Knox in a steady drizzle; stopping by Rosen’s Store in Bucksport (to buy a replacement for a long-lost raincoat of mine), including a nice visit with Rep. Kimberly Rosen (Senator Rosen was out of town on legislative work); picking up a few secondhand books at the Big Chicken Barn (a favorite day trip destination for my husband and me before we had children); and climbing on the rocks at Schoodic Point for an hour, we finally settled down for the night in Prospect Harbor, the home of the last sardine cannery in the United States, Stinson’s Cannery. Sardines (young herring under 7 inches long) I learned are an integral part of the recent history of the Downeast area. Herring are a family of over 200 fish species that are generally small, flat, and silvery, swim in large schools, feed on plankton, have soft fins that lack a spine. Native Americans are believed to be the first fishermen in Maine who used weirs to capture herring. Made of sticks driven into the muddy bottom of the bay with branches woven in between as nets, Native American weirs were well adapted to capture these small fish traveling in large schools. When Europeans arrived, many were already familiar with herring as a staple in their diet from their home countries. In 1875 the first sardine cannery was opened in Eastport. By the early 1990s, about 56 canneries dotted the coast of Washington County, out of a total of about 75 in Maine. The industry soared in part because canned sardines were a staple in many American workers’ lunch pails. The height of the demand appeared to be World War II, when canned sardines were purchased by the US Government for their troops. Even after the war, demand expanded by those wanting herring for fish bait, especially for lobsters and crabs; for animal feeds such as for pets, livestock, poultry, and fish raised in fish farms; and the scales for the pearl coat used in nail polish, lip gloss, paint, and buttons. However, with a steady decline in demand for sardines as exemplified by a 70% drop in US consumption of sardines over the past 50 years, with only 7% of American now saying they eat them; with a decline in herring stocks in the Bay of Fundy, especially those close to shore that can be easily caught by weirs or coastal seiners; and with competition from other countries (India, Scandanavia, etc), the sardine industry has practically collapsed, relative to its former self. On the other hand, some optimists feel the sardine industry may be on the brink of a revival. With a renewed interest in healthy foods, sardines certainly meet many criteria for a healthy source of protein. They are very high in omega 3 fatty acids, so critical for healthy neurological development. They are also high in vitamins B12, B3, D, calcium, selenium, tryptophan, and phosphorus. And, sardines are low in mercury and other toxins. With herring being the most common source of bait for lobster and some other fish as well as being such a healthy food, perhaps the optimists are right. Let’s hope so!